Claudia Gray is a gem. She has some seriously impressive skills as an author and knows how to weave a story together that is not only complete, but page-turning and ultimately satisfying at the end. She also knows her Star Wars and with this second book featuring Leia is an expert on the Princess of Alderaan. She took time out of her busy schedule to answer some questions just for Disney Nerds. Me: First of all, I LOVED the book. I was so impressed that it had a different tone than Bloodline but at the same time was still distinctly Leia. Leia: Princess of Alderaan had a young adult flavor to it and feels like a story about a teenager coming into her own, while Bloodline was more mature, had more complex plotlines, and dealt with a Leia who carries with her all the years of experience as a leader. How did you go about doing that? I’m so glad you enjoyed the book! In some ways I wish I’d known I’d be writing LEIA back when I was working on BLOODLINE—it would’ve been interesting to link those from the start. As it was, I came into this book having already finished BLOODLINE, dealing with an older, wiser and in some ways sadder Leia. So I needed to reverse that. We know Leia was already a major leader in the Rebellion by age 19; that alone tells us she didn’t start small. Her entry into the Rebel Alliance had to show why Mon Mothma, General Dodonna and other leaders would already trust and respect her. But she couldn’t just be the same princess we met in Episode IV. This would be a Leia who hasn’t been in battle yet. She hasn’t had to give orders that might get people killed. Even though Alderaan has an egalitarian sort of monarchy, Leia at 16 is still a little sheltered, a little softer. But her intelligence, strength and will are already in place. What essential elements of her character did you draw from that connected them together across the years (and across the books)? The most fundamental thing about Leia, for me, is her absolute commitment to protecting the powerless and standing up for what she believes to be right. That seems to be a part of her character that never fades. It may be more nuanced as she gets older, but just as powerful. Here, that quality can make her headstrong—even lead her to act too rashly. And of course Leia has a temper! There are signs of that in LPOA, though I wound up deciding it would be less on display there—if only because a princess still living in a palace, surrounded by loving parents and loyal servants, in a galaxy not yet at war, has fewer annoyances to deal with. Finally, it was important to highlight her abilities as a leader, and to show the origin of some of that ability. She knows a few things from having grown up royal, but this novel gave me the chance to show her learning to deal with soldiers, Imperial officers, and—most alien of all—other teenagers. You have a special connection to Leia. What about the character are you drawn to? How much do you personally identify with Leia? I feel like we all have a special connection to Princess Leia. For my entire generation—and the generations since—she’s the heroine. The first one we imprinted on as kids, the one that stays special and beloved to us throughout our lives. That’s very much true for me. And yet as much as I love her, I don’t know that I identify with her that strongly. Like, I wish I were that smart/feisty/strong/fearless. But I feel like I know her. In some ways, she is a friend, one I’ve known nearly my own life. Her loves and losses and disappointments feel very real. I was so happy to see Panaka again! I have wondered not only what happened to some of those characters but also what would happen when someone saw Leia who knew Padme very well. What inspired you to bring him back? And why make him a Moff? I love how you sprinkle beloved and familiar characters into the storyline. Captain Antilles, Grand Moff Tarkin, and I especially love the detail you go into with Bail Organa. As a proud father of a wonderful daughter myself, I found I related to him strongly. How did you go about choosing who would appear? Which ones are your favorites? Well, I always want to throw in as many characters as possible! But “as possible” means “as could believably and meaningfully play a part in the story’s events.” In LPOA, of course, so many characters not only can be a part of the story but almost have to be in order for things to be believable. Mon Mothma has to be there. Grand Moff Tarkin doesn’t have to be…but we know he and Leia already personally knew and disliked each other before Episode IV, and this seemed like a great opportunity to set that up. 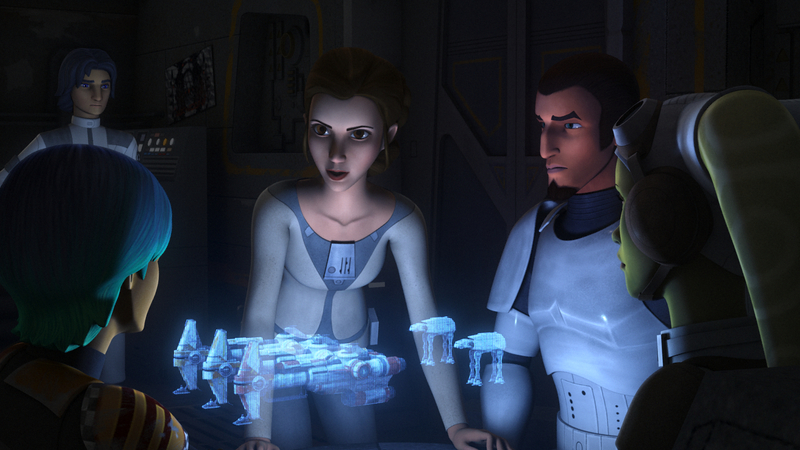 Captain Antilles already had the Tantive IV, which was a natural ship for Leia to take on some of her adventures. But of course the main characters the story deals with, besides Leia, are her parents. Bail Organa has long been one of the great heroes of the saga, albeit one who’s almost always been in the background; meanwhile Breha somehow had almost gone unexplored in the 40 years since we first met Leia. We know from Leia’s adoration of her parents that she had a good relationship with them, and I think we can tell from her courage and her character that they raised her well. Many people seemed to believe that Bail “brought Leia in” with the Rebel Alliance. I thought it would be more interesting if Leia brought herself in—and if Bail’s feelings about her involvement were actually very complicated. This is about his little girl going to war. What father isn’t going to hesitate? And there’s no way Leia turned out so strong if her female role model was some shrinking violet. Breha Organa was queen of Alderaan and a founding member of the Rebel Alliance. She had to be a woman of incredible bravery and insight. Thank you so much for taking the time to share your thoughts! Our readers love to hear from authors and especially appreciate the insights talented people like you can offer us into the motivations of many of our favorite characters. Thank you!